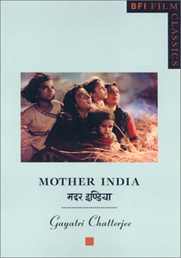 Gayatri Chatterjee’s book on the Indian epic film Mother India (Mehboob Khan, 1957) is one of a series of books that the British Film Institute has commissioned on the popular Indian cinema, now commonly known as Bollywood. At first slowly, now at a rather brisk pace, scholarship on the popular Indian cinema is growing both in India and in the West. In terms of the scale of production, audience demography and the aesthetics of populist entertainment drawing not only from India’s own syncretically rich performative traditions but also from Hollywood, the Indian film industry is a complex mass cultural phenomenon. Within this history several films have taken on the aura of well-loved items of memory. This remembering seems to have a peculiarly Indian charm; one night at a party in Pune where the Indian film archive and film school are housed I had the amazing good fortune to see and hear Indian film scholars and writers like Ashish Rajadyaksha, Mahdhav Prasad, Geeta Kapur and Suresh Chabria sing and dance to movie music and talk to each other in fragments of memorable Hindi film dialogue from the Golden Age of the 1950s. As a Lankan I sat in a corner in awe of this manifestation of Indian cinephilia. Mother India is a film that I saw with my family in 1958 when I was a girl of 11 and I still remember the outer suburban cinema where we saw it. I am quite sure that none of my middle class friends saw it, nor would any of them have gone to see a Sinhalese film, much less sing songs from them or remember their dialogue. Most middle-class Lankans of my generation grew up on Hollywood and would never go see a Sinhalese film; that was what our domestic aids saw. I also remember newspaper images of the cast of Mother India coming to Lanka to play cricket with our stars in the late 1950s. The Lankan cinema, though an imitation of the Indian melodramatic generic prototype, never developed the epic form of narration, which is a strong feature of the popular Indian cinema and also characterises Mother India. Nor did Lankan cinema develop the sort of nationalist allegories that mark not only Mother India but other Indian films as well. This link between the cinema and the narrative of the nation is a persistent feature of popular Indian cinema. Chatterjee’s book deals with the production history and national context to the making of Mother India, as well as the background of the director Mehboob Khan, and as such offers valuable information about a film that is a much loved “popular classic”. She says that the film has been in continuous distribution for 30 years not only in India but also globally and that this ended with the introduction of cable television. The writer has researched the archive of the Mehboob studios and provides a picture of the conditions within which a film of this scale and ambition was created. It is worth noting at this point in Indian history that the director, Khan, and the main star, Nargis, were both Muslims. That an iconic Indian film embodying the struggles of a humble peasant woman who is allegorised as “Mother India” should be made and played by two Muslims is perhaps not so remarkable in that the Indian film industry has been immune to the kind of racism that has come to pervade the wider political and social life in the wake of Hindu fundamentalism (Hindutva). Chatterjee makes the point that in the cosmopolitan Bombay of the 1950s (now Mumbai) “a Muslim, a Parsi and a Hindu were teaming up to do things together – films were being made in those days about this kind of cooperation…The Bombay film industry was an oasis of communal harmony in the post-Partition period – it remains largely so even now”. Khan was the son of a village blacksmith from Gujarat who came to Bombay as a young boy to see movies, began his career as an actor in 1927 in silent films and graduated to the role of director in sound films in a Bombay studio. His first film Al Hilal (1935, The Judgement of Allah) was a historical spectacle and soon he came to be known as the “Cecil B. DeMille of India”. Khan established his own Mehboob Studio in 1943 where he directed Nargis in a series of films including the highly successful Andaz. Chatterjee informs us that Nargis was born as Fatima Rashida and was groomed for stardom by her mother who was a dancer and singer. She adds that “Mehboob chose Nargis for the role of a traditional peasant woman, even though she excelled as a modern, independent-minded, sexually aware woman – the sexuality that Nargis brought to the screen was not blatant or aggressive but touched with innocence as well as passion and a simple directness”. She adds that Nargis in the role of Radha had to go through all the stages of life from youth to old age and portray the life of a woman while embodying the archetype of the mother and further not any mother but “mother India”. Just about five years after India’s independence the nationalist slogan that allegorised the nation as the mother/goddess was still a living memory, and the film works on these two levels, that is as both an individual drama and an epic struggle that has a nationalist mythico/historical resonance. The hammer and sickle insignia of the Mehboob Production company also intimates the socialist leanings of the director. Chatterjee informs us that Turkey “banned Mother India as a communist film. Mehboob’s Insignia was excised from the print sent for Oscar nomination” where it lost the award for the Best Foreign Language Film by one vote to Fellini’s Nights of Cabiria. It however won all the national awards and a European award for Nargis that year. The information in the book is utterly fascinating and yet it leaves me unsatisfied because of the rather weak conceptualisation of the material and anecdotal style of writing. For example the idea of epic cinema is mentioned but nowhere is it discussed in any detail. The link with DeMille is fascinating; he sent a letter to Khan congratulating him on his composition of space and close-ups. This could have been a point at which the differences between the Indian epic cinema and Hollywood could have been delineated. Or an exploration of the difference between the dramatic and the epic in Indian cinema could have been explored. The beautiful colour stills call out for close analysis in terms of this distinction. In the absence of such work, Chatterjee’s book is largely a collection of valuable information. But books in this series do need a strong conceptual focus so as to bring out the creative ways in which the syncretic pre-cinematic traditions are transformed by the cinematic intelligence of one of India’s great popular directors. Through such work, the wider public who seem now ready to respond to Bollywood would realise that it has a complex history too; some fantastic films and a lot of trash. For a Lankan who has spent her scholarly youth studying the largely trashy Lankan cinema, with nothing remotely like a Mother India to boast, it is a great thrill to see this Indian film acknowledged by the BFI’s prestigious Film Classics series. But the BFI need not bow to diasporic pressure and publish indiscriminately on Indian cinema. Just as in any other industry there are creative work and run of the mill stuff and now that Indian cinema is on the agenda it should not just be satisfied with simply publishing a bunch of books to coincide with wider Bollywood events in London; it should have a long term commitment to the best in Indian cinema. In this way it can get over any residual postcolonial guilt and help create an even playing field for the game of publication as the British umpire did in the film Lagan despite the bigotry of the colonial English cricketers.